THE GREAT PATRIOTIC WAR WAS A TREMENDOUS UPHEAVAL FOR BOTH THE TRETYAKOV GALLERY AND THE ENTIRE COUNTRY. MARKING THE 70TH ANNIVERSARY OF VICTORY, WE ALSO CELEBRATE THE ANNIVERSARY OF THE GALLERY'S RE-OPENING AFTER ITS RETURN TO MOSCOW FROM EVACUATION1. Finally, on May 18 1944, the committee for the Arts under the aegis of the council of People’s commissars of the USSR issued a directive: "Every shipment of art museums’ holdings from evacuation must be carried out only with approval from the committee for the Arts under the aegis of the council of People’s commissars of the USSR, and only when a suitable space is made ready to accommodate these holdings"3 By that time the Gallery’s building, damaged by shelling in 1941, was mostly restored. Despite enormous difficulties, Zamoshkin did all he could to prepare competently and thoroughly for the return of the holdings. 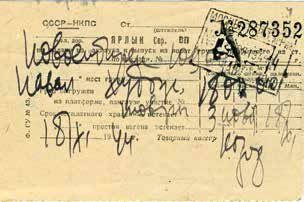 On September 5 he sent a telegram to Novosibirsk: "Immediately get ready for shipment all evacuated items stop awaiting decision"6. 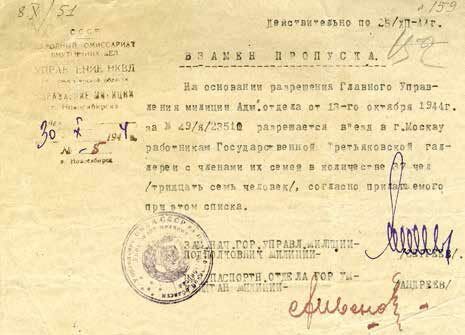 Finally, on October 4 1944, the Council of People's Commissars of the USSR issued Decree No. 1335: the collections of art museums of Moscow and its environs were to be brought back from evacuation. After that, on October 9, the Committee for Arts issued a similar order to have the holdings sent back to Moscow by November 1. Even before the return of the museum's holdings the staff had started developing a plan for the Gallery's new display. The researchers in Moscow and Novosibirsk had drafted their versions, sometimes engaging in debate and arguing over the arrangement of pictures in the rooms. Upon her return home, Zinaida Zonova wrote to Sophia Goldshtein, who remained in Novosibirsk: "My work is not on the right track yet, and in silence I sometimes sketch our future display, carefully guarding the boundaries of the territory assigned to me earlier. Of course, I'm being closely watched by Atsarkina and Arkhangelskaya, who are anxious that I'll submit all this stuff without consulting them. Atsarki- na openly told today that she will persuade Al[exander] Iv[anovich] [Zamoshkin] to authorize her to draft the layout for the Romantics. I know that these efforts are premature and the space is going to be re-allocated in the future, and yet I cannot contain myself. Just recently I recalled how you and I fought over the 11th room. "11 The new layout for the display was to be ready by October 1. The report shows that by that date the staff had only begun to "define borders within the display between different eras and develop general principles for the new display"12. 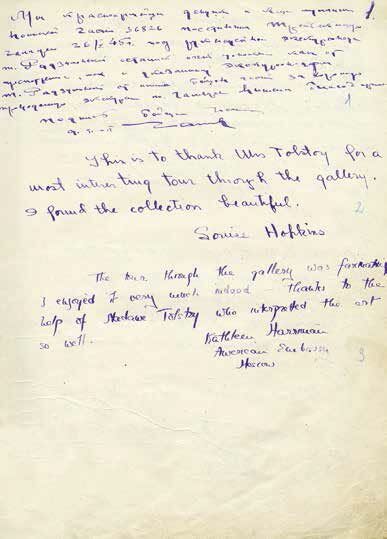 It should be noted that during the war the Gallery had received 1,015 new pieces (167 paintings, 55 sculptures, 792 drawings, one icon)13, and some of these acquisitions were to be included in the display rooms. 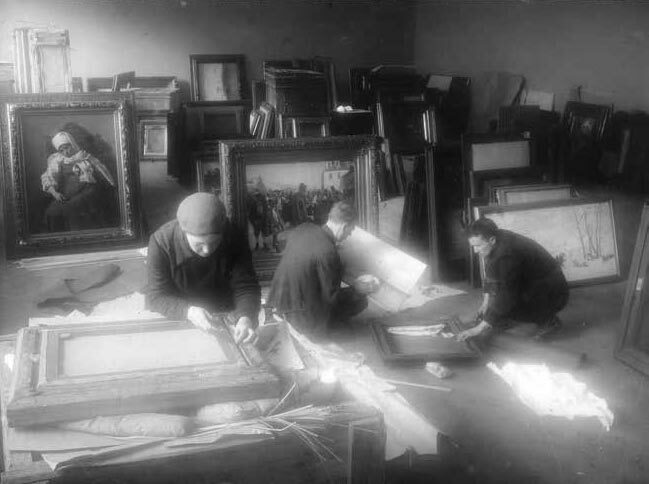 The success of the Repin exhibition and the generally positive opinions about the arrangement of the pictures enabled the Gallery's management to apply a similar solution to the museum's display in its entirety. One can judge the result achieved from the reaction of Pavel Tretyakov's granddaughter Marina Nikolaievna Gritsenko, who noted after the ceremony of the Gallery's opening: "And the arrangement of pictures - mostly positive - a sparse one, highlighting (in contrast to the previous one) every painting, helps to create a festive mood at the display! The paints are quite good as well, with the exception of the green in the icons rooms, which is too intense and in some cases kills the originals. But how superbly beautiful - that is not the word for it - Rublev is! The paintings look and feel unfamiliar. After an absence of four years - and most importantly, after all that has been experienced and left a mark on the soul during all these years - things appear different, you re-evaluate things even though you're not aware of it yet. And the arrangement of pictures encourages that. See how Serov looks now - never before have 'Verushka' and 'Girl in the Sunlight' been showed off so wonderfully17. In the small rooms, with lateral illumination they are in a 'private viewing' environment, which focuses attention on every piece. The Serov is now 'concentrated' and does not become blurred the way it had previously in the big rooms. How magnificent are Vrubel's colours! The very intensity of this larger-than-life colour scheme!. Vereshchagin looks brilliant - he has never looked that way. But when you proceed to Surikov after him, you become disappointed since he looks lacklustre, somewhat faded. Only now do I understand Vereshchagin's popularity in the last century and Pavel [Tretyakov's] interest in him! "18 Not all arrangements were equally felicitous, but one must admit that it was a step forward rather than a repetition of the past. Initially it was planned to open the Gallery by February 2320 but the museum was unable to have everything finished by that date.21 A huge number of paintings had to be unpacked and put into frames, while some works were in renovation. 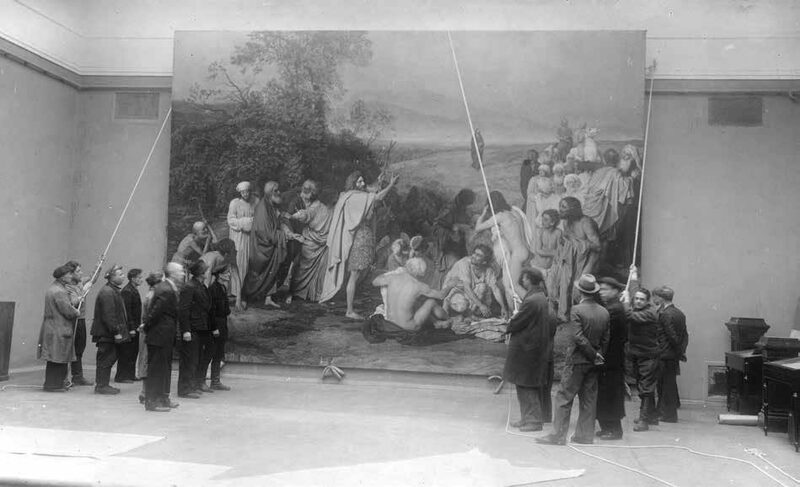 Mounting such large pieces as Alexander Ivanov's "The Appearance of Christ before the People", Vasily's Surikov "Boyarynya Morozova" and Mark Antokolsky's "Ivan the Terrible" also required a great deal of effort. Everyone worked with great enthusiasm, and the researcher Yelena Kamenskaya later reminisced: "Moscow led a life full of excitement and joy. The Gallery was grappling with the problems posed by the new display, and examined and stabilized the artwork returned from Novosibirsk. There was a real enthusiasm for work and academic exploration, the awakening of creativity. "22 By mid-May everything was ready for the Gallery's opening. 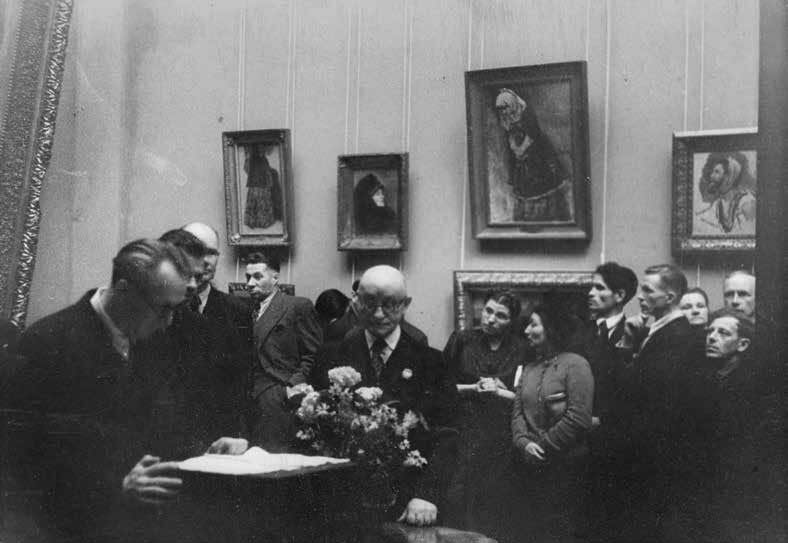 About the Tretyakov Gallery's activities during the WWII, see the following: "The Tretyakov Gallery and Its Staff during the War (1941-1945). Photocopy edition. Moscow: 1975; Druzhinin, S. "In the Days of War and Victory (from S. Druzhinin's'Memoirs')" //"Iskusst- vo" (Art) magazine. 1980. No. 5. Pp. 43-46; Konchin, Ye. 'The Ordeal. The Tretyakov Gallery during the War' // "Sovetsky muzei" (Soviet Museum) magazine. 1984. No. 5. Pp. 30-37; Polishchuk, Ye. 'The Tretyakov Gallery during the Great Patriotic War' // "Iskusstvo" (Art) magazine. 1985. No. 5. Pp. 38-41; Kaftanova, T.'The Way It Was. The Tretyakov Gallery during the Great Patriotic War' //"Tretyakov Gallery Magazine". 2005. No. 2. Pp. 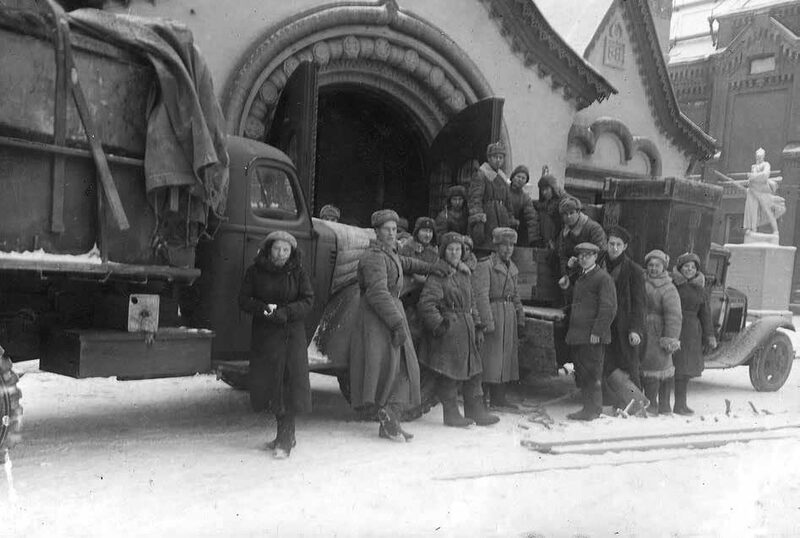 60-73; Buyanova, N., Valova, M., Zhukova, L. 'The Evacuees. 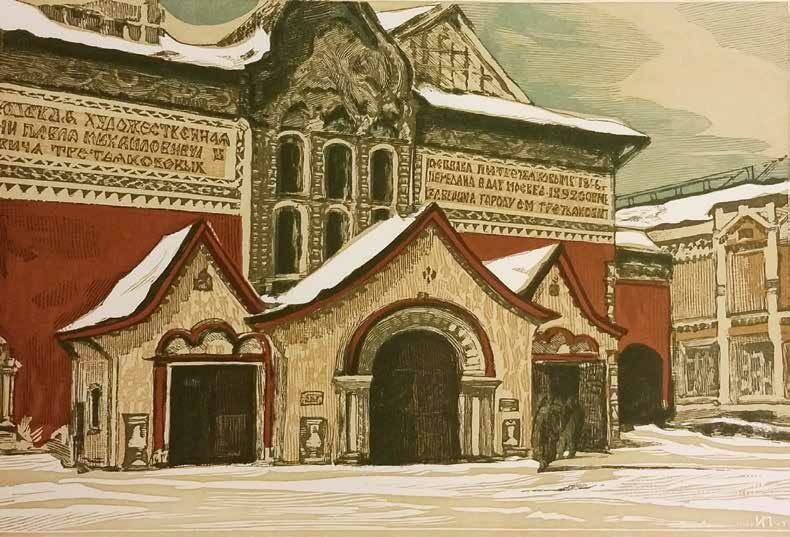 From the Collection of the Tretyakov Gallery's Department of Manuscripts' //"The Museum Front of the Great Patriotic War". Moscow: 2014. Pp. 310-318. 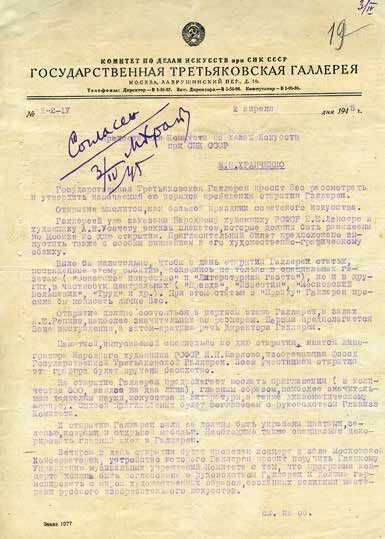 Natalia Zograf's letter to Olga Lyaskovskaya, May 16 1942. Department of Manuscripts, Tretyakov Gallery. Fund 183. Item 42. Sheet 4. Directive No. 34 of the Committee for the Arts under the aegis of the Council of People's Commissars of the USSR. A copy. May 18 1944. Department of Manuscripts, Tretyakov Gallery. Fund 8. II. Item 264. Sheet 1. Zinaida Zonova's letter to Sophia Goldshtein, August 11 . Department of Manuscripts, Tretyakov Gallery. Fund 161. Item 104. Sheet 1. Sophia Goldshtein's letter to Olga Lyaskovskaya, September 10 1944. Department of Manuscripts, Tretyakov Gallery. Fund 183. Item 35. Sheet 39-39 reverse. 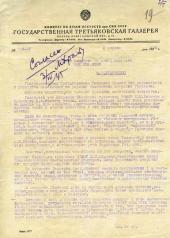 Correspondence with the Tretyakov Gallery's affiliate in Novosibirsk: 1944. Department of Manuscripts, Tretyakov Gallery. Fund 8.I (1944). Item 6. Sheet 61. 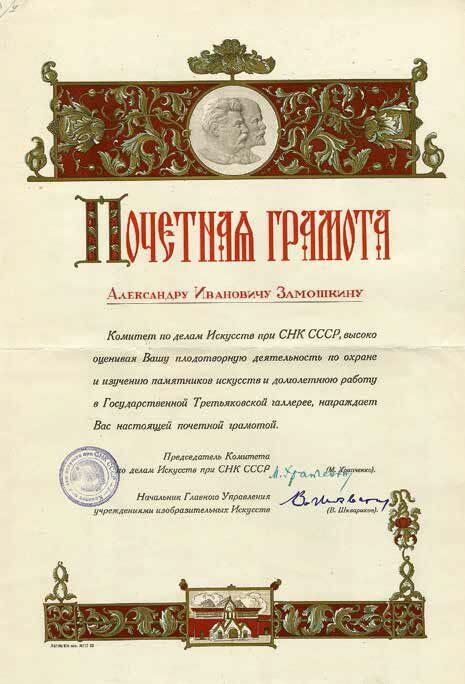 The Tretyakov management's orders issued in 1944. Department of Manuscripts, Tretyakov Gallery. Fund 8.I (1944). Item 1. Sheet 168. 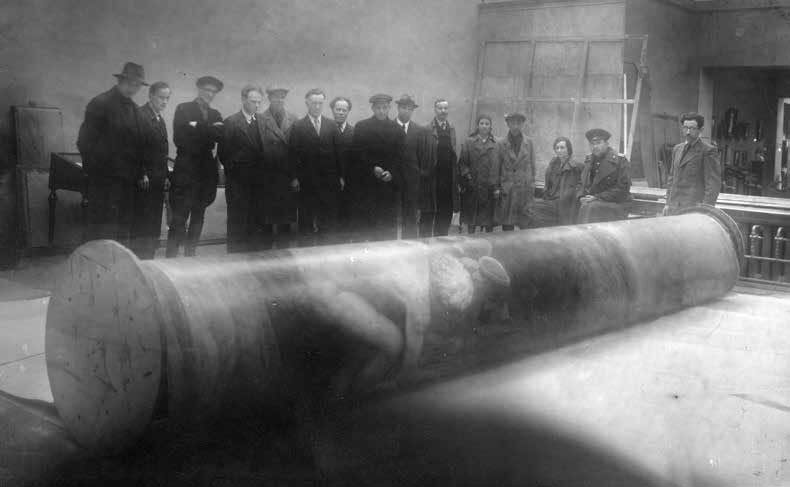 Waybills for the Tretyakov Gallery's shipment when the collection was brought back to Moscow from evacuation. November 3-18 1944. Department of Manuscripts, Tretyakov Gallery. Fund 8.IV. Item 208. Sheet 1-6. Silversvan, Ye. 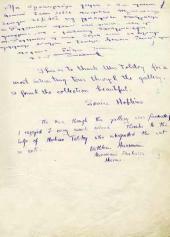 "Memoirs about how the Tretyakov Gallery Worked during the Great Patriotic War". (1965). Department of Manuscripts, Tretyakov Gallery. Fund 8.II. Item 72. Sheet 4. Tretyakov Gallery Annual Report: 1944. Department of Manuscripts, Tretyakov Gallery. Fund 8.II. Item 21. Sheet 1. 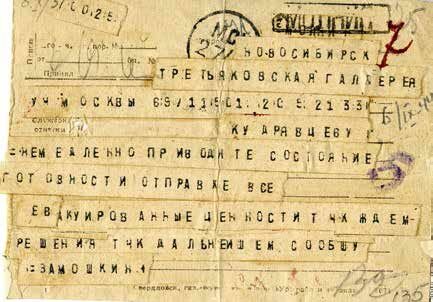 Zinaida Zonova's letter to Sophia Goldshtein, August 22 1944. Department of Manuscripts, Tretyakov Gallery. Fund 161. Item 105. Sheet 1 reverse. Tretyakov Gallery Annual Report: 1944. Department of Manuscripts, Tretyakov Gallery. Fund 8.II. Item 21. Sheet 4. Silversvan, Ye. "Art acquired during the war: a reference sheet". April 21 1945. Department of Manuscripts, Tretyakov Gallery. Fund 8.II. Item 21. Sheet 51. Zamoshkin, A., Zhizhkov, G."A brief article about the new display at the Tretyakov Gallery". (1945). Department of Manuscripts, Tretyakov Gallery. Fund 8.II (1945). Item 25. Sheet 3. Zinaida Zonova's letter to Sophia Goldshtein, August 11 . Department of Manuscripts, Tretyakov Gallery. Fund 161. Item 104. Sheet 2-2 reverse. The pictures in question are Valentin Serov's "Girl with Peaches" (1887) and "Girl in the Sunlight" (1888). Gritsenko, M. "Wartime Diaries". Notebook 10. March 10-July 5 1945. Department of Manuscripts, Tretyakov Gallery. Fund 125. Item 99. Sheet 132-133. Grabar, Igor. 'The Celebration of Russian Art'. In:"Trud" (Labour) newspaper. May 18. 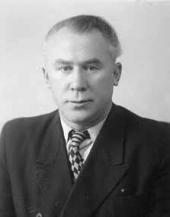 See: S. Pronin's letter to the director of the 4th State Photofactory, January 5 1945. Department of Manuscripts, Tretyakov Gallery. Fund 8.II. Item 9. Sheet 6. See: Verbatim record of the meeting of the Tretyakov Gallery Academic Council. December 15 . 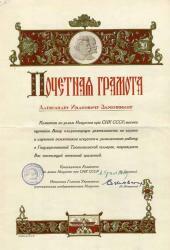 Russian State Archive of Literature and Arts. Fund 2322. Kamenskaya, Ye. "Memoirs". Department of Manuscripts, Tretyakov Gallery. Fund 221. Item 1. Sheet 67. 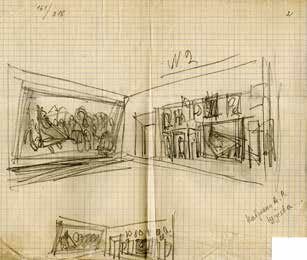 Zamoshkin, A., Zhidkov, G."Notes about the new display at the Tretyakov Gallery" (1945). Fund 8.II. Item 25. Sheets 1, 12. In August 1941 bombs destroyed the main entrance to the Gallery and the main staircase, which was adorned with the gypsum statue of Stalin by Sergei Merkurov. This was the only piece from the Gallery's collection to have been destroyed during the war. Gritsenko, M. "Wartime Diaries". Notebook 10. March 10-July 5 1945. Department of Manuscripts, Tretyakov Gallery. Fund 125. Item 99. Sheets 132,133-133 reverse. Rumyantseva, V. May 17 1945 (1965). Department of Manuscripts, Tretyakov Gallery. Fund 8.II. Item 71. Sheet 1. Tretyakov Gallery Comments Book. 1945-1949. Department of Manuscripts, Tretyakov Gallery. Fund 8.II. Item 12. Sheet 1. 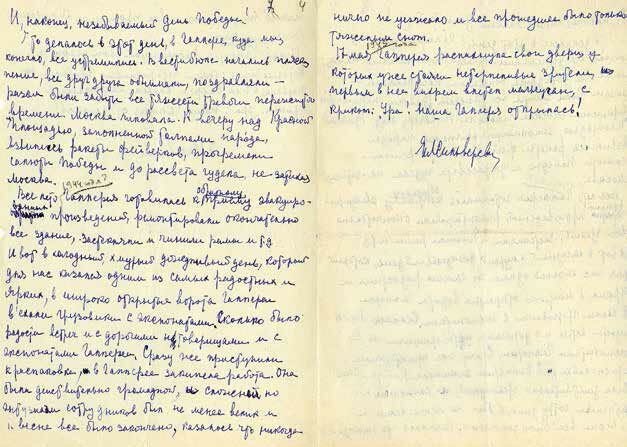 Nicholas Roerich's letter to Igor Grabar, May 8 1945. In: Roerich, Nicholas. "Literary Works". Moscow: 1974. P. 409. Tretyakov Gallery Comments Book. 1945-1949. Department of Manuscripts, Tretyakov Gallery. Fund 8.II. Item 12. Sheet 2 reverse. Opening ceremony at the Tretyakov Gallery, Surikov Room. Welcoming speech from Alexander Zamoshkin, Director of the Tretyakov Gallery. (Igor Grabar, behind floral display). May 17 1945. 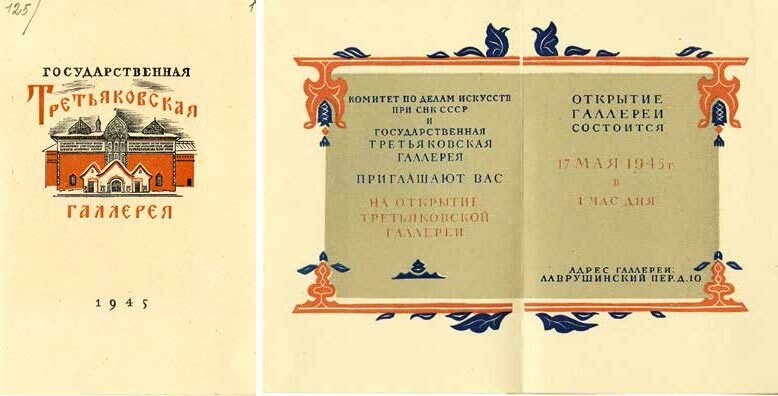 Invitation to the opening ceremony of the Tretyakov Gallery, May 17 1945.